Often times, I keep a packet of puff pastry in my freezer. Just in case, I need something sweet to satisfy my sweet tooth. Simply draw out a sheet of it and pop it in the oven. Very quickly, we have something crunchy on the plate. Strawberries are in season sold at bargain price. By spreading some homemade vanilla custard that I'd share the recipe soon, I could quickly get my family enjoyed a simple and delicious dessert after dinner. 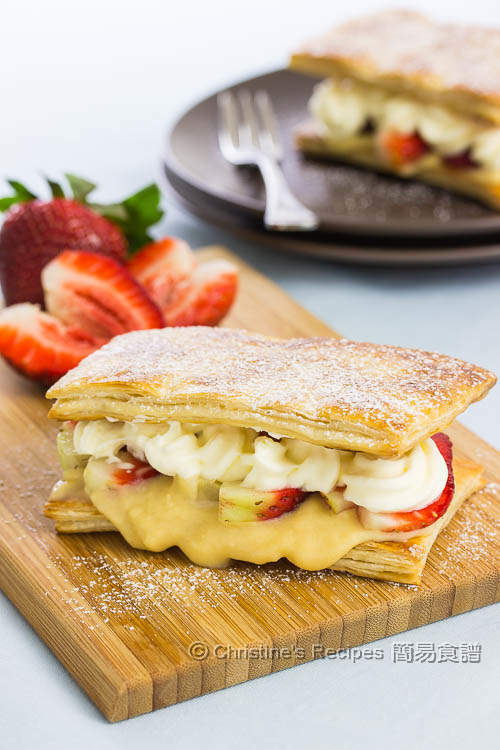 The tangy taste of strawberries goes perfectly with the creamy custard and mildly sweet whipped cream. Both of the crunchy and creamy textures going hand in hand to make this dessert a hero. Not surprisingly, it’s gone very quickly and the plates were swiped clean. To prepare the syrup: Heat sugar and water in a small saucepan for about 5 minutes. Remove from heat. 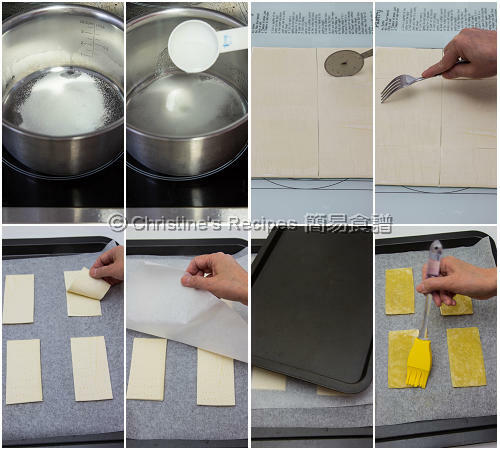 Thaw the puff pastry at room temperature until soft. But don’t let it turn too soft. Otherwise it’s hard to handle. Cut into 8 portions, each 12cm x 6cm. Use a fork to prick holes on the puff pastry. Put one pastry portion onto another one in order to make 4 thicker slices. Transfer to a lined baking tray. Cover with baking paper and place another baking tray on top to prevent the pastry from rising unevenly. Bake in the preheated oven for 6 minutes. Remove the top baking tray and baking paper. Brush the pastry with the syrup and bake for another 7 minutes, or until golden brown. Turn the other side up. Brush with syrup and bake for another 2 minutes. Let cool on a wire rack. To assemble: Spoon some custard on top of a pastry rectangle. Arrange the quartered strawberries as desired. Decorate with whipped cream. Cover with another pastry rectangle. Sprinkle with icing sugar. Enjoy ! To make whipped cream: Use an electric mixer to beat 100 ml thickened cream with less than 1 tablespoon of sugar until soft peak forms. Or you might use the store-bought. 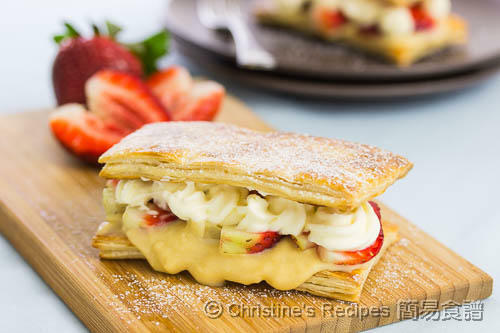 The baked puff pastry, custard and whipped cream can be made well ahead. When it’s time to serve, then assemble them together. This time I used Pampas puff pastry that’s available at supermarkets. I’ll post the homemade vanilla custard recipe very soon. They look so flaky and delicious! Thanks for the tip on keeping them even. Oh my gosh! This looks like heaven to me!! thanks so much! I'm very interested in your custard recipe though - as custards vary a lot and I'd like to make this as you have first before I decide if I need to tweek it. Yeah, will post very soon. Thanks for your patience.